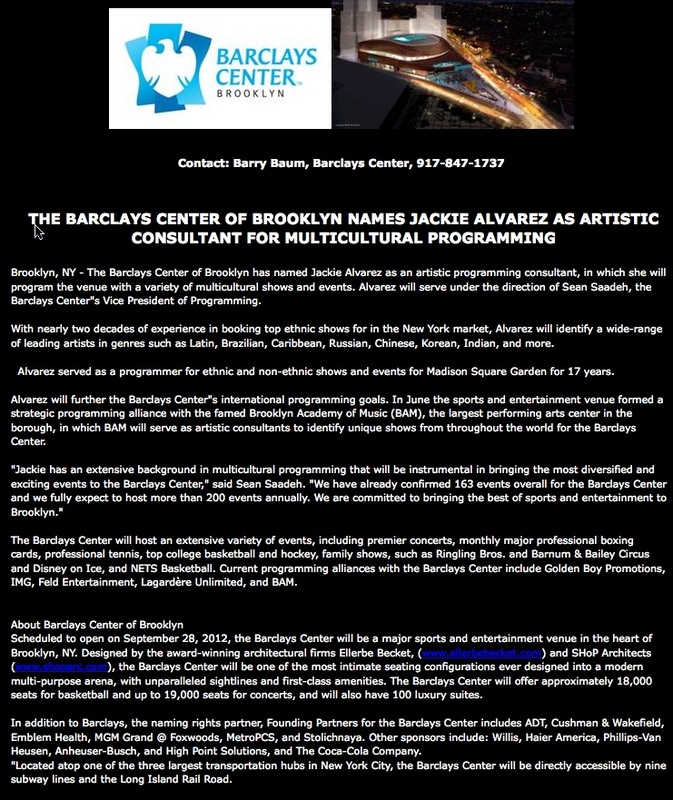 Barclays Center of Brooklyn has named Jackie Alvarez as an artistic programming consultant, in which she will program the venue with a variety of multicultural shows and events. Alvarez will serve under the direction of Sean Saadeh, Barclays Center's vice president of programming. With nearly two decades of experience in booking top ethnic shows for the New York market, Alvarez will identify a wide-range of leading artists in genres such as Latin, Brazilian, Caribbean, Russian, Chinese, Korean, Indian and more. Alvarez served as a programmer for ethnic and non-ethnic shows and events for Madison Square Garden for 17 years. And what about the Sportsplex? Now, with principals of the New Jersey Nets in negotiations to move their team to a new arena in Downtown Brooklyn, some prominent Brooklyn officials believe the dream for such a facility will be enhanced, not quashed, by a professional team’s occupancy here. Markowitz cautioned that he could not comment on negotiations or whether he played any part in bringing Ratner and the Nets together. What else at the arena? "Jackie has an extensive background in multicultural programming that will be instrumental in bringing the most diversified and exciting events to the Barclays Center," said Sean Saadeh. "We have already confirmed 163 events overall for the Barclays Center and we fully expect to host more than 200 events annually. We are committed to bringing the best of sports and entertainment to Brooklyn." The Barclays Center will host an extensive variety of events, including premier concerts, monthly major professional boxing cards, professional tennis, top college basketball and hockey, family shows, such as Ringling Bros. and Barnum & Bailey Circus and Disney on Ice, and NETS Basketball. Current programming alliances with the Barclays Center include Golden Boy Promotions, IMG, Feld Entertainment, Lagardère Unlimited, and BAM.